I’ve had Mark of the Ninja down as its own indie game, a 2D stealth game that presumably has you ninjaing somewhere quietly. Beyond that, I’m actually not sure where it goes or what to compare it to – especially that’s on the list – and in appearance I think the looks of Muramasa: The Demon Blade come closest. It’s one of those games where I just have to go and play it. You get woken up as your dojo is under attack. You fight off the intruders, mostly by moving around them, tricking them and hiding them in the many tunnels present in the dojo. Then you go out for revenge. There’s more to the story than this, mostly leading to how you gain your abilities and how they avoid your outlook on life, but it feels like that’s what happened early on. Although upgrade purchasing comes in late (only in the third level), there’s a lot of emphasis on finishing challenges to be able to afford them (to the point that I worried I’d missed them) through various collectables and challenges the game throws at you. They give you different ways to attack or distract, lending itself to the different approaches to the game. After all, while this is a stealth game, the game still needs combat mechanics, and you could probably hack and slash your way through. The system is quite in depth, although sometimes a bit difficult to come to terms with. I started doing okay if I needed to do something, but the difficulty of the enemies goes up enough that you clearly need more experience. Besides, the game clearly rewards stealth in its missions, so it’s never really the best solution. It’s about avoiding enemies by sneaking past through vents, taking them out from the back (and hiding their bodies) and often enough, hiding from the ceiling in the shadow as they walk past. It mostly is done intuitively – you can read everything you need to know from the screen, which doesn’t necessarily make it easier, but feels fairer. So yeah, sometimes the aggressive approach is needed, but it never felt quite as satisfying. Maybe when you could use stealth to do both, but there’s always that pressure to hide the body so you couldn’t be found. The automatic defenses add to this – usually aggression doesn’t help, but it puts everyone on a higher alert state that always makes things worse. 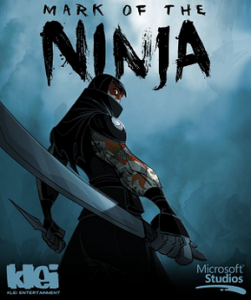 Mark of the Ninja is a great stealth game. The 2D nature means it can set up more elaborate puzzles while giving you a better view of the surroundings and it’s all stylized enough to give you a good idea of what everything will do. The story content takes some time to take off – I never got quite far enough to see much of it – but it seemed quite promising with some mystical elements. There are some good challenges in here and enough variety to keep up interest.